Our cat, Rain, wanted a shot at being a guest cat blogger. I told him I’d see what I could do. Here he is playing Beatles Monopoly. 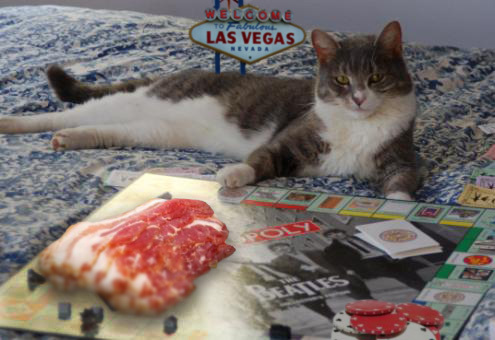 A cat playing Beatles monopoly? Add bacon and something from Vegas and this picture would be my permanent masthead. Piri took a great picture, and made it sooooooo much better. That cat’s a hustler! Do NOT bet against him. @Piri – George Lucas would approve, but I think it still needs something. Lasers?